He opens up his mouth and a sweet tale unfolds. Come into my mouth and then he swallows them whole. And the whole damned meal can make you go mad. In the belly of the beast the compass finds Hellmouth. And saw the head of the Leviathan up around the bend. "By his neesings you will know him" - is it day or is it night? You can hardly breathe from the sound of his snoring. These visions of the neesings keep me up awake all night. And in the final revelation, who has the beast’s bigger bite? Is it true a little worm killed the Devil's own Kraken? Legends are stand-ins for our unvoiced fears. So is the myth of the Hellmouth a simple metaphor for meals? Or is it the oldest male nightmare of the wound that never heals? From a boiled down Bible - Revelations to Ruth. Our original sin is our fear of the Mother. From the place all life emerges - an unsuspecting metaphor. drawing us to pleasures of the flesh not hell. Her jaws clamp shut, welcome to Hellmouth town. 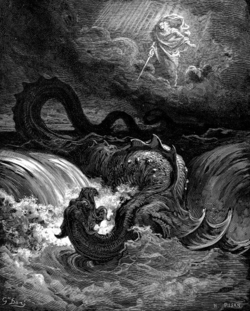 And call me Leviathan, with soul where it lies.